What do you do when you wake up early on New Year's Day, the sun is shining and you're looking forward to spending the day with some wonderful people? Well, you get up and bake some scones of course! Sift the flour into a large bowl and stir in the baking powder, salt and sugar. Add the diced butter and rub it into the flour with your finger tips until you have a mixture a little like dried breadcrumbs. Add the beaten egg, double cream and enough milk to moisten. Mix well until you have a soft and doughy mixture that is not too moist. Don't overwork the dough. Roll into a ball and roll it out lightly on a lightly floured surface until it is about 1inch thick. Cut out with a round cutter and place the rounds onto a non-stick baking tray. Gather the off-cuts and carefully roll out again (you really want to make sure that you don't overwork the dough), cut and repeat until you have used up all the dough. Brush the tops with the egg and milk glaze and bake for 15-20 minutes, until the tops are golden. Oh, may I have scone? I'll bring jam and clotted cream over. Happy New Year Sylvie! You cant beat a good homemade scone, strawberry jam and clotted cream mmm. Happy New Year! NY Day was beautiful here in Cornwall and I couldn't think of a better way to start it- how could I being Cornish!!! with jam and clotted cream...yum! Happy new year! Scones would be a great way to start my day!!!! Fresh scones with strawberry jam and a nice pot of tea - yummy! I just made some too. And I finally (finally!) got them to rise! JamesB, the perfect combination, I agree. Beth, it was beautiful up North as well and the scones were much appreciated pre- and post our afternoon walk. pigpigscorner, that's definitely the best way to have them. Val, not bad for breakfast at all, but I do like to eat mine in the afternoon. Kenzie, chocolate seems like an interesting addition. Lucy, you just put a big smile on my face. Here's to an all change 2010! 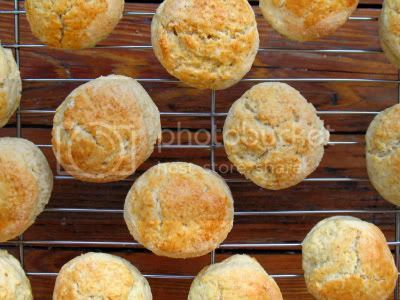 Sylvie I love these scones, look absolutely yummy!! !